This post contains affiliate links. If you make a purchase after clicking a link, I'll receive a small commission. First a clown, then a cockatiel... what's next? A macaw, of course! He's a bird, but he looks a little sheepish. 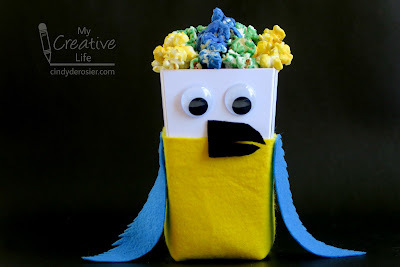 Cut the white felt to size and wrap it around the popcorn box. Wrap yellow felt around the bottom 2/3 of the popcorn box. Glue the eyes onto the white felt. Cut a black beak and glue it where the white and yellow felt meet. Cut a pair of wings from the blue felt and glue them to the sides of the box. Pop the popcorn. Place each color of candy melts in a separate bowl and melt them, following the package instructions. Pour popcorn into the melted coating and stir. Spread the popcorn onto parchment paper to dry. Fill the popcorn box with popcorn. When you reach the top, arrange the colors so that yellow is on the outside, then green, and blue in the center.